Weather control. Juxtaposing those two words is enough to raise eyebrows in a world where even the best weather models still fail to nail every forecast, and when the effects of climate change on sea level height, seasonal averages of weather phenomena, and biological behavior are being watched with interest by all, regardless of political or scientific persuasion. But between the late nineteenth century—when the United States first funded an attempt to “shock” rain out of clouds—and the late 1940s, rainmaking (as it had been known) became weather control. And then things got out of control. 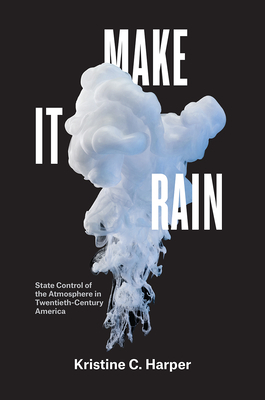 In Make It Rain, Kristine C. Harper tells the long and somewhat ludicrous history of state-funded attempts to manage, manipulate, and deploy the weather in America. Harper shows that governments from the federal to the local became helplessly captivated by the idea that weather control could promote agriculture, health, industrial output, and economic growth at home, or even be used as a military weapon and diplomatic tool abroad. Clear fog for landing aircraft? There’s a project for that. Gentle rain for strawberries? Let’s do it! Enhanced snowpacks for hydroelectric utilities? Check. The heyday of these weather control programs came during the Cold War, as the atmosphere came to be seen as something to be defended, weaponized, and manipulated. Yet Harper demonstrates that today there are clear implications for our attempts to solve the problems of climate change. Kristine C. Harper is associate professor of history at Florida State University. She is the author of Weather by the Numbers: The Genesis of Modern Meteorology.